USB and Network A4 Mono Laser Printer. Personal Compact Duplex Ready Desktop Printer. Brother HL-5450DN. 1 x Brother HL-5450DN. Connectivity: USB & Ethernet. Print Speed: Up to 38 ppm Black. Warranty ; 6 Months RTB Warranty. 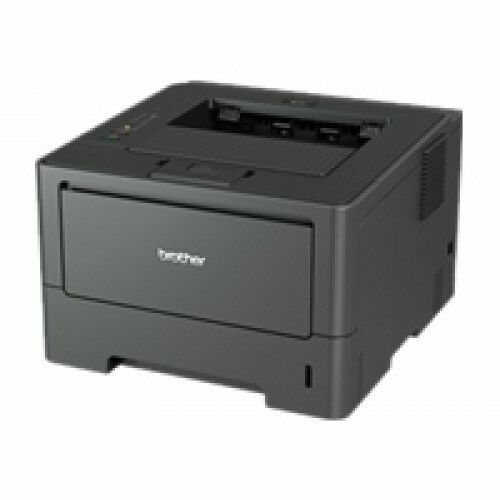 The HL-5450DN laser monochrome printer from Brother features front/back printing and a USB 2.0 port.With integrated Ethernet, this printer functions on a network. Compatible with Windows, Mac and Linux, you'll get a print rate of 8.5 seconds for the first page to appear.Storing up to 800 sheets, and with high printing speed, the HL-5450DN will help improve your productivity! Good printer with lots of life left in it. Good printer with lots of life left in it. The drum needed a wipe to improve the print quality but otherwise perfect for my use. It has great speed along with great quality printing. What more do you need? Couldn't be happier with this purchase!